CINCINNATI -- Students at one Greater Cincinnati elementary school have a new opportunity to learn about conservation. 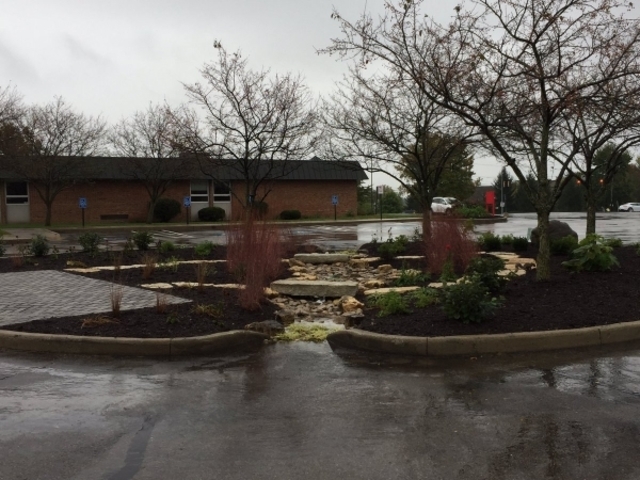 Through partnerships with local businesses and soil and water conservation agencies, Kings Local School District this fall built a rain garden in a school parking lot. "It's been an incredible opportunity for us as a community to come together and build this rain garden," said Cheryl Montag, principal of J.F. Burns Elementary. A rain garden is a depression featuring native plant species. Stormwater runoff typically goes into storm drains, which deposit the water into creeks and rivers. A rain garden slows stormwater runoff by collecting rain and filtering it naturally through plant roots. "It acts as sort of like a sponge and a filter to take stormwater and clean it," said Shannon Russell, owner of Mother Nature's Classroom . The water that accumulates in the J.F. Burns rain garden becomes groundwater that feeds into nearby Landen Lake, she added. Through Mother Nature's Classroom, Russell visits each classroom in the elementary school five times a year to deliver science and nature enrichment aligned with students' classroom curriculum. The rain garden is the newest addition that will facilitate her outdoor lessons. The elementary building also features two outdoor classrooms that include an ecology trail and a certified monarch waystation garden. "There's a lot of opportunities for our children to be outside," Montag said. Kings is one of a few school districts in the region incorporating conservation into their facility designs and landscaping. 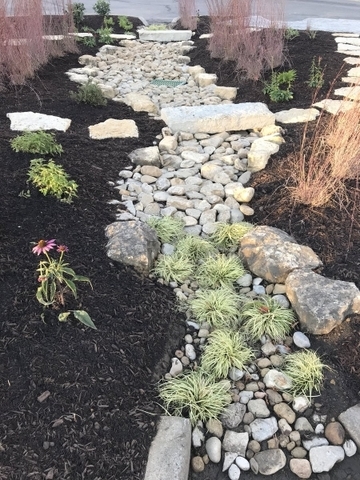 The Clermont County Soil and Water Conservation District partnered with Milford Junior High nearly 10 years ago to create a rain garden on the school's property. Students designed the garden, researching its ideal placement and which native plants would work well in it. The rain garden is also maintained by students. "We look at it that we're doing a service to the community by taking care of our water," said Rachelle Rapp, a science teacher at Milford Junior High. The school's rain garden ties in with other initiatives as well, like students' efforts to monitor water in the nearby Little Miami River. "By doing this as a community service, it's not just me saying, ‘You need to learn this, this is important,'" Rapp said. At Milford High School, students have invested not only time and effort but also financial resources in conservation. Student council members recently used money from homecoming ticket sales to install water fountains with sensors to refill bottles. Council members were quick to support the initiative suggested by high school principal Josh Kauffman. "They immediately jumped on board with the idea," said Jeanette Holmer, freshman biology teacher and student council advisor. The group funded six of the eight fountains installed about a month ago. The impact is already noticeable. There are fewer plastic bottles in recycling bins, and digital readouts on the fountains indicate 3,000 to 4,000 bottles have been saved by refilling containers. "Most of the kids that I see now are ... refilling water bottles," Holmer said. Little Miami Schools has its own certified wildlife habitat garden at the district's intermediate school. Sixth-grade teacher Stephanie Baldwin, who spearheads the school's Garden for Wildlife program, began her conservation efforts about three years ago. With the help of a grant from the Ohio Department of Natural Resources, she created a monarch waystation in 2015. Her students planted native flowering species to attract the butterflies and observe and monitor their migration. Creating the wildlife habitat was as simple as requesting grass not to be cut in a section of school property near a pond. Baldwin also plans to add native prairie plants to the area. "It's just nice to take a little section back and restore for animals," she said. While the implementation of conservation efforts may look different from one school to the next, nearly all are tied into education in some way. "It seems to work really well for those kinesthetic learners," Russell said. Depending on their grade level, lessons can cover topics ranging from colors and patterns to erosion and water quality. One of the most significant things students learn, though, is about the impact of their actions -- both positive and negative. "I'm using it as an education tool, teaching kids about citizen science," Baldwin said.